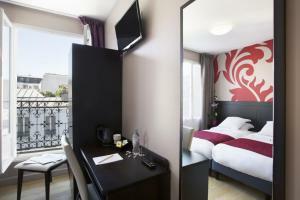 Hotel Bastille is situated in Paris, within 1.5 km of Opéra Bastille and Pompidou Centre. The property is located 2.4 km from Notre Dame Cathedral. Louvre Museum is 3 km away. Accessible by lift, all rooms in the hotel are fitted with a flat-screen TV. Guest rooms feature a desk and a private bathroom with a shower. 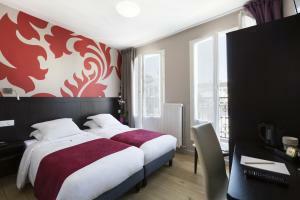 Tuileries Garden is 3 km from Hotel Bastille, while Orsay Museum is 4 km from the property. When booking 5 rooms or more, special conditions and supplements may apply. Guests are required to show a photo identification and credit card upon check-in. Please note that all Special Requests are subject to availability and additional charges may apply. 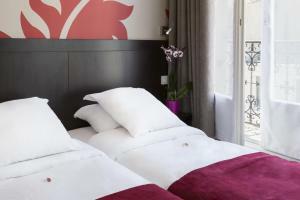 Rate: € 105.00 ... € 235.00; select dates below to get current rates. Rate: € 84.00 ... € 290.00; select dates below to get current rates. 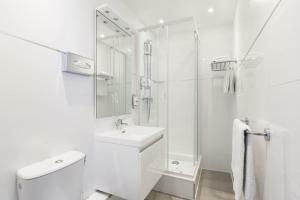 This single room features a private bathroom fitted with a shower.